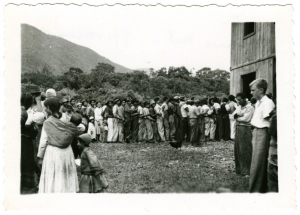 Hackett, Lewis Wendell, “Quince Mil, Yellow Fever vaccination,”100 Years: The Rockefeller Foundation, accessed March 25, 2015. As the Ebola epidemic winds down in West Africa, the World Health Organization is stressing the necessity of reestablishing routine immunization activities, especially for measles and pertussis (whooping cough). Estimates suggest that the rate of routine immunization against preventable diseases, including measles, plummeted by up to 75% during the Ebola epidemic. Measles outbreaks often follow humanitarian crises, including epidemic outbreaks of other diseases, violent conflict, and ecological disasters. This is due to the sheer virulence of the disease, and the fact that baseline immunization rates tend to be lower than for other EPI vaccines —an outbreak of measles indicates the early stages of health system failure. The inverse is also true; where vaccination campaigns are successful, and there is buy-in from local communities, the entirety of the health system can be strengthened from the ground up. The diseases targeted for immunization efforts have shifted over time, but the message has remained the same: mass vaccination campaigns are among the best ways of lessening the disease burden, and tackling the health problems that affect developing societies head-on. But the story is rarely that simple. History has lessons for global health, as always. It goes without saying that mass vaccination campaigns are no easy task, in scope and in complexity. In the 21st century, conducting the campaigns requires coordination between institutions like the WHO, various levels of government, international humanitarian groups like Médecins sans Frontières, and generous financiers like the Bill and Melinda Gates Foundation. This multiplicity of stakeholders is not novel. Indeed, throughout the 20th century, numerous institutions and agencies tracked epidemiological statistics with their own mandates and priorities, and large (mostly American) philanthropic foundations pursued their own agendas in the field of public health both at home and abroad. The best example is the Rockefeller Foundation, whose International Health Division (IHD) was one of the foremost agencies for global health work before the WHO was established in 1948. The IHD worked in concert with national governments in order to shore up local health services to provide better primary care services, and also embarked on numerous vaccination campaigns, with an emphasis on yellow fever. It was therefore a major presence in Latin America, the Caribbean and, later, Africa. The Foundation’s interest in disease eradication worked to capitalize on the vigour of scientific and medical research in the first half to the twentieth century, when new cures and treatments were being discovered at an unbelievable rate. But the interests of the IHD also seemed to closely mirror those that supported American interests, both in terms of domestic and foreign policy. From the outset, the Foundation displayed a keen interest in malaria and yellow fever, both of which were significant threats in the American South. The interest in yellow fever was far from altruistic —the construction of the Panama Canal underlined the need to control the disease in tropical climates where the United States had an economic and military interest. And yellow fever proved to be one of the major barriers to the successful completion of the Panama Canal. The IHD was instrumental in the development and manufacture of an attenuated yellow fever vaccine; before 1939, over half the IHD budget was allocated to yellow fever research. By 1947, the Foundation produced and distributed enough vaccine to significantly curtail yellow fever worldwide. The vaccination campaigns, in conjunction with attempts to control mosquito populations, were lauded as a way of improving the health of populations on the whole, and as an exemplar for local health workers to emulate in the future. Though there were setbacks in the creation of the vaccine itself, its use in the field is generally heralded as a success story – albeit one marred by American imperialism and paternalism. After the Second World War, it was expected that the WHO would take on the responsibility as the central governing body for the smaller regional health agencies, in addition to pursuing its own mandate. In actuality, the advent of the Cold War and the divergent priorities of the regional agencies meant that the WHO had a diminished capacity to pursue independent programs, and functioned more as an advisory body than an active force in global health. This had the dual effect of ensuring that it could rarely pursue projects geared at improving the structural capacity of health systems, and instead focused on the application of so-called “magic bullet cures” like vaccines. Nonetheless, the early days were optimistic, and it was hoped that the combination of dispatching technical experts and capitalizing on recent scientific advancements would obliterate new diseases as quickly as they were discovered. By 1958, smallpox was identified as a target for eradication by the WHO. By 1980, the disease was officially declared eradicated, marking one of the greatest achievements of 20th century global health. It could not have been accomplished without the centralized efforts of the WHO and its armies of health workers. Though the traditional narrative is one of triumphalism, some historians have complicated the picture and explored the way that local health workers and authorities interfaced with the larger program in order to meet targets, but also held it back in certain instances. Other attempts at eradication have not been so successful. Polio stands as the most telling example of how a lack of local support for vaccination campaigns can stagnate progress. One need only Google “polio + Nigeria/Afghanistan/Pakistan + vaccinator” to see how the complexities of 21st century geopolitics infiltrate the process. Global vaccination campaigns are far more complicated than the picture of industrious individuals going out to remote corners of the globe to bring medicine to the masses allows. Vaccines are criticized as a tool of corporate imperialism, or more insidiously, as an instrument to be wielded by the CIA in order to accomplish strategic objectives, as was the case with the fake polio campaign that facilitated the capture of Osama bin Laden. This image is not improved by the fact that so little pharmaceutical R&D goes into diseases that disproportionately affect developing countries. Recognizing more troubling episodes in the history of vaccination campaigns should not diminish support for their use today. The reduction of vaccine-preventable diseases through immunization is of immense benefit to public health, as history has repeatedly shown. That said, the efficacy of disease control programs, especially when eradication is the stated goal, almost universally requires that multiple organizations and levels of government share the burden. Global health targets – among them, improvements to the social determinants of health, enhancement of existing infrastructure in underserved countries, and attempts to reduce the disease burden, can only be met through close partnerships between local governments and a wide array of stakeholders. Self-interest and science can coexist in the quest to improve global health, be it through immunization campaigns, construction of more effective health centres, or improving water treatment facilities. But with every additional stakeholder, especially those who are rich and powerful, comes an added layer of complication that has the potential to detract from the broader goal of improving health outcomes for all. Takahashi, Saki, C. Jessica E. Metcalf, Matthew J. Ferrari, William J. Moss, Shaun A. Truelove, Andrew J. Tatem, Bryan T. Grenfell, and Justin Lessler. “Reduced Vaccination and the Risk of Measles and Other Childhood Infections Post-Ebola.”Science 347, no. 6227 (March 13, 2015): 1240–42. EPI refers to the WHO Expanded Program on Vaccination, which was introduced in 1974 to establish routine vaccination schedules for children worldwide, including vaccines for TB, diphtheria, pertussis, tetanus, oral polio, and measles. In 1999, the Global Alliance for Vaccines and Immunization (GAVI) was created to improve child health in the poorest countries by extending the EPI mandate and establishing a coalition of UN agencies, public health institutes, donor countries, and humanitarian foundations including the Bill and Melinda Gates Foundation and the Rockefeller Foundation that would raise awareness and advocate for the importance of immunization in lessening the overall disease burden. For an institutional history of the International Health Division of the Rockefeller Foundation, with emphasis on its public health work, see John Farley, To Cast Out Disease: A History of the International Health Division of the Rockefeller Foundation (1913-1951). Oxford University Press, 2004. On the Caribbean context, see Stephen Palmer, Launching Global Health: The Caribbean Odyssey of the Rockefeller Foundation. University of Michigan Press, 2010. Max Theiler, the scientist responsible for developing the vaccine, was awarded a Nobel Prize in 1951. Bhattacharya, Sanjoy. “Struggling to a Monumental Triumph: Re-Assessing the Final Phases of the Smallpox Eradication Program in India, 1960-1980.”História, Ciências, Saúde-Manguinhos 14, no. 4 (2007): 1113–29. See also Bhattacharya and Rajib Dasgupta,“A Tale of Two Global Health Programs: Smallpox Eradication’s Lessons for the Antipolio Campaign in India,”American Journal of Public Health 99, no. 7 (2009): 1176–84.